Holton High School students aren’t the only ones benefiting from a team effort of the Holton school district and the Greenbush special education cooperative of Girard to give students a greater exposure to the STEM curriculum. 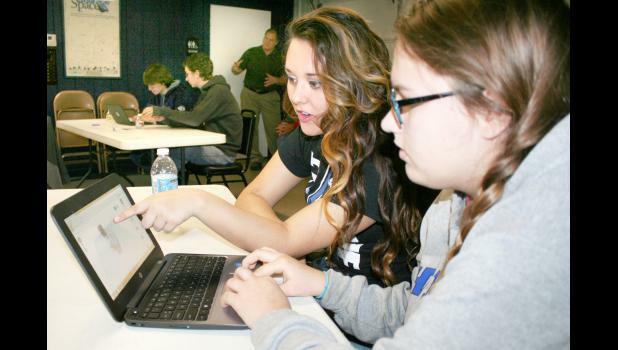 On Thursday, HHS students were using computer-aided draw­ing (CAD) software to create a Thanksgiving turkey during a STEM course at the Banner Creek Science Center and Observatory. Students were also given the op­portunity to observe how CAD-cre­ated designs can be brought to life through the use of a 3D printer. But a few other visitors to Ban­ner Creek Science Center that morning were able to see what STEM-based courses could offer students as well as themselves. Mike McManigal, treasurer of the science center’s board of directors, as well as Holton resident Tom Da­vies and his brother, Gary, visiting from Texas, were able to experi­ence the 3D printer at work. “That is too cool,” McManigal said in response to how the 3D printer performed. Giving HHS students more of an idea of what to expect from STEM — which stands for Science, Tech­nology, Engineering and Math — is largely the idea behind Holton teaming up with Greenbush for courses held last week and this week at the science center, accord­ing to Dr. Joe Kelly, assistant Holton superintendent and Colo­rado Elementary School principal. Courses such as those of­fered during the visit from Green­bush’s mobile science lab — 3D printing, robotics and coding — also provide teachers and other staffers with a learning opportunity, Kelly said. Furthermore, Kelly said he is hopeful that other area schools, including Jackson Heights and Royal Valley, will also team up with Greenbush in the future. Greenbush program instructor Rich White agreed, noting that the courses offered by the Greenbush mobile lab are merely “get kids in­terested in STEM” courses, but they may lead to greater interest in the future. Kelly said the Holton district worked with Greenbush in review­ing mobile lab resources available from the latter and determining how those resources could be meshed into Holton’s class objec­tives to determine which courses the mobile lab would bring to Ban­ner Creek. One such course in­volves laser-based cutting tools, he said. Even though White said the two 3D printers used during Thursday’s class were “already obsolete,” they still can be utilized to wow not only students who are unfamiliar with the technology, but teachers and other members of the community as well. It also gives older visitors to the courses an insight of just how much education has changed. The Holton district was able to make use of Greenbush’s mobile labs through a donation from the district’s Parent-Teacher Organiza­tion that covered half of Green­bush’s $5,000 costs for this week’s visit, Kelly said. Banner Creek Science Center is also looking to cover part of those costs through donations from the science center’s support­ers, he added.